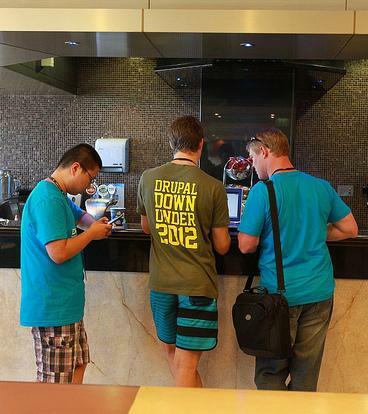 Technically, Sydney was my first DrupalCon. Although I have attended a number of local Drupal events and camps, this was a little different. Not least because it's the first DrupalCon in the Southern Hemisphere, the first in APAC and of course the first in Australia, but also because it had a distinctly global feel. Swathes of people from all over the world attended, shared their ideas and tweeted up a storm. Much in the same vein as Drupal Downunder 2012 in Melbourne, subsequent to the event I'm even more bouyed up and immersed in the Drupal community. Being surrounded by so many like minded Drupal people who share both similar interests and experiences is an invigorating experience to say the least! With all of this additional energy, I will be volunteering my time for the next DrupalCamp Canberra and DrupalACT. My next public contribution will be at the DrupalACT March meetup where I'll be presenting on Drupal distributions, a topic I've been interested in for a while. The full write up of distributions, how they work and best practices will be available shortly after the 14th March so until then; anticipation!